President Donald Trump took to Twitter to mock Democrats for technical failures during a rally outside the Supreme Court protesting his executive order temporarily banning people entering the US from seven Muslim-majority nations. 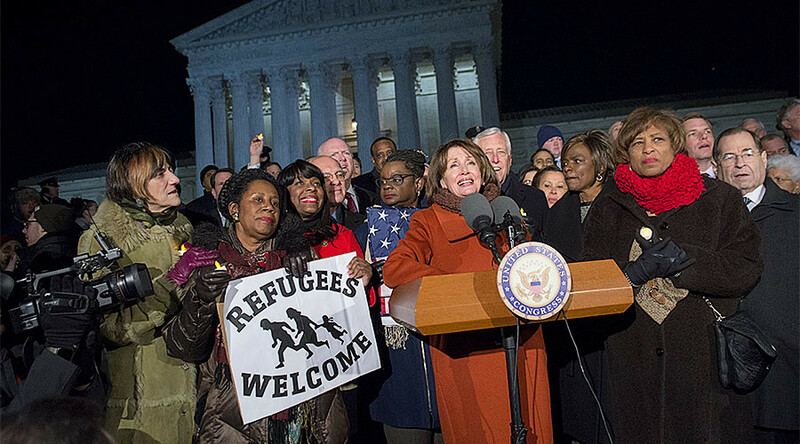 Trump rediculed Democrats early Tuesday for their Monday night protest at the Supreme Court, saying it was a “mess.” "Nancy Pelosi and Fake Tears Chuck Schumer held a rally at the steps of The Supreme Court and mic did not work (a mess)-just like Dem party!" Trump tweeted. Congressional Democrats rallied Monday evening outside the US Supreme Court in Washington, DC with thousands of protesters urging Trump to rescind his executive order. The Democrat’s protest led by Senator Charles Schumer (D-New York) and Representative Nancy Pelosi (D-California), was hampered by a malfunctioning microphone. Democrats quickly responded, arguing the president should stop name calling. Matt House, a spokesman for Senate Minority Leader Schumer, said Trump should learn that name calling is not going to solve the self-inflicted problems of the Trump administration. House said Trump should repeal the executive order halting the entire US refugee program and banning all entries from seven Muslim-majority nations for 90 days. Realizing the microphone wasn’t working, lawmakers broke into an impromptu rendition of Woody Guthrie’s famous folk song,“This Land is Your Land,” before turning to a bullhorn to address the crowd. Representative Jerrold Nadler (D- New York) who protested at JFK on Saturday when the effect of the executive order became known, joined Pelosi at the rally. The Hill reported thousands of protesters attended the rally - many, federal workers who came after work. Police attempted to keep First Street NE open to traffic, but soon gave up as the crowd filled the road between the court and the Capitol.